The annual membership is valid for 365 days from the day you enter your activation code on the Tugo website. Once you make your purchase, you will receive an email within 2 business days that includes your unique membership activation code and instructions on how to activate your membership. 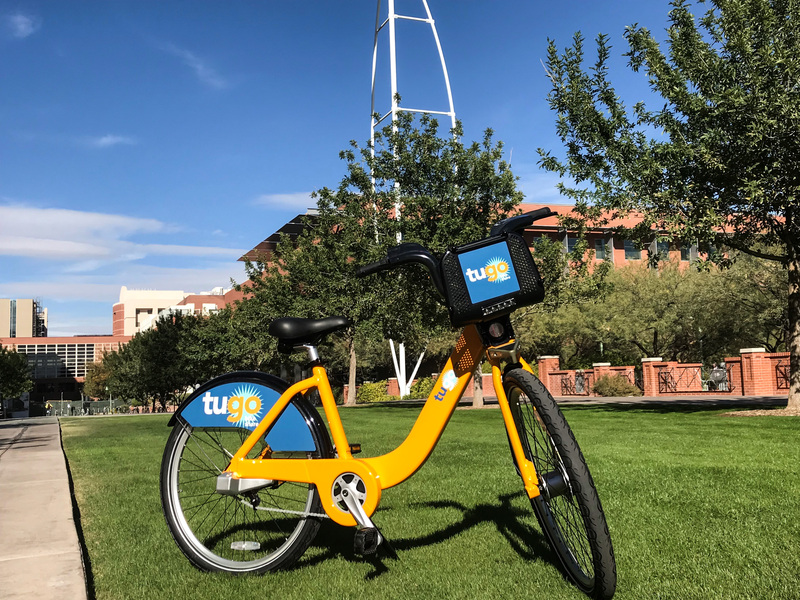 Annual membership includes access to 330 bikes at 36 stations on and near the University of Arizona campus. Make unlimited 30-minute trips on Tugo. Return the bike to any station. For more information, including a How to Ride video, visit the Tugo website. Access the Tugo system with either the CycleFinder app or your Tugo membership card (annual membership includes both). Tugo bikes are convenient, well-maintained, and easy-to-ride. Tugo bike share bikes are perfect for one-way trips! Take a Tugo bike from your last class of the day to a restaurant downtown, then take the streetcar back to campus. No need to worry about bike parking or theft! When you reach your destination, simply dock your Tugo bike at a Tugo station. No need to carry a heavy u-lock or look for a bike parking spot. With built in lights, you can ride Tugo at night!